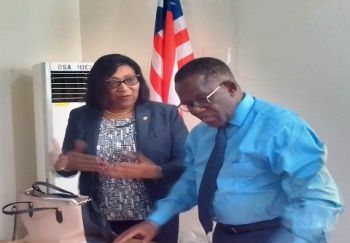 Monrovia-Liberia: Monday: March 25, 2019: Commerce and Industry Minister, Professor Wilson K. Tarpeh said the Liberian government remains committed to providing the necessary environment that will promote sustainable business sector intended to stimulate the Liberian economy. Professor Tarpeh said among key strides being made by government to boost the country’s business climate is the diversification of the agriculture sector through practical steps in broadening Liberia’s current economy that is private sector- driven. He however said despite the Liberian economy being heavily dependent on the private sector, government remains cognizant of its role in creating the requisite environment for a flourishing business sector. Professor Tarpeh said seventy percent of the Liberian population is involved in agriculture. He however noted that such agricultural activities are being carried out in a disserted way that needs to be restructured to improve overall economic output. Minister Tarpeh observed that the absence of a unified strategic approach in the country’s agriculture sector is a challenge to which the CDC –led government of President George Manneh Weah is trying to find a solution. The Commerce and Industry Minister also named other challenges as energy and roads, but noted that the Liberian government is making efforts to address the issues. He said one of the best ways to arrive at a unified approach to the country’s disserted engagement in the agriculture sector is to revitalize the Liberia Produce Marketing Corporation (LPMC) and consolidate the cocoa market. Professor Tarpeh said apart from the diversification, Liberia wants to go into other sustainable areas, including oil palm, coffee and cash crops, which according to him will not only serve as import substitution but added sources of sustainable income. Minister Tarpeh made the observation recently at the Commerce and Industry Ministry, when he met with a two-man delegation from a Japanese company, Marubeni Corporation (Africa). He assured the delegation that once they are able to identify their area of specific interest, the Commerce Ministry will link them with the requisite line institution for specific areas of collaboration and to commence business in Liberia. The two man- Manrubeni delegation was accompanied to Minister Tarpeh’s office by the Liberian Ambassador accredited to Abidjan, Cote D’Ivoire, Madam Willye Mai Tolbert King. For his part, the General Manager of Manrubeni Adbijan Liaison Office, Mr. Akihiko Koenuma, said they were happy for the meeting with Professor Tarpeh. Mr. Akihiko said prior to the Wednesday, March 20, 2019 meeting with the Liberian Commerce Minister; his team had long ago wished it had the opportunity of having such discussions. He expressed interest in the power and infrastructure sectors of Liberia. In an apparent overview of Manrubeni’s work over the years, Mr. Akihiko said the company has built three factories in Angola and has a coal project in Australia, etc. Marubeni Corporation is a Japanese company, headquartered in Tokyo, Japan, with 131 branches and offices in 66 countries and regions.